My friendship with Samantha goes back to eighth grade, when we played night games with other neighborhood kids every summer night and did not maim ourselves jumping from the tree house onto the trampoline in her backyard. In high school we survived dominated AP Language, AP Literature, AP European History, AP US History, and AP US Government together. Later we attended different universities, but we corresponded and kept up through college craziness, summer study abroads, and dating drama. Now we both have husbands and she has a baby, and we’re still the best of friends. Samantha just stitched this lovely gift for me! (How she found the time to do that with a new baby, I have no idea.) 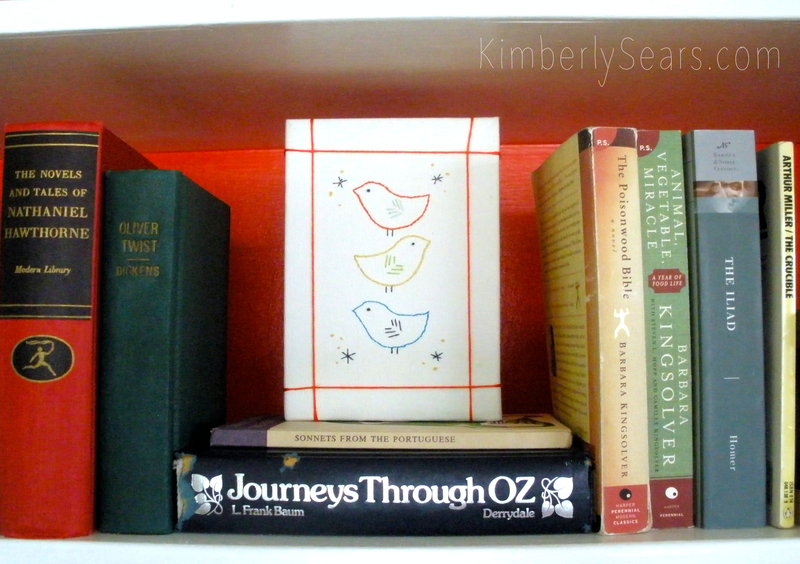 These sweet little birds are the perfect addition to our built-in bookshelves. They make their nest with the gorgeously illustrated old copies of Oliver Twist and Journeys Through OZ that Samantha gave to me. And see that book of Portuguese love sonnets? That was a wedding present from Samantha and her husband. I think Mark and I will take a leaf out of their book and start reading love poems together for date nights sometimes. John Donne, here we come! A friend who shares your obsession with old books, who has read everything under the sun and always has great reading recommendations? A friend who hand-stitches a thoughtful gift for you just because? A friend whose constant friendship has endured more than a dozen years? Very lovely indeed! Thank you, Samantha!